Why are some chords more closely related to one another than others? What do tonic, subdominant and dominant mean? What is a parallel chord? How does all this relate to degrees? A chord progression is a set of chords following each other in a specific order. There are certain patterns as well as certain pairs of chords that do not sound especially good together. Regardless, there exist thousands of ways to combine a limited number of chords. First, we will look at parallel chords. Their roots are always a third apart and they have two chord components in common. The chord of C contains the notes C, E and G.
The chord of Amin contains A, C, and E, so C and E are the common, ‘shared’ notes. The two parallels of a major chord are both minor chords. One of them is a major 3rd up, the other a minor 3rd down. Any minor chords parallels will be major chords. One a minor 3rd up, the other a major 3rd down. The point of this is rather simple. As parallel chords have so much harmonically in common, they will sound well together, and as a result are used frequently in chord progressions. A different approach; to think of chords of a progression in terms of their specific functions. The main functions are called Tonic, Dominant and Subdominant. 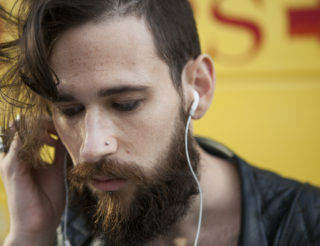 Important tip: always find the shortest way for each voice to move from one chord to another! To better explain, it is best to look at the voices of chord progressions and examine how they move when a chord changes. As always, it is not so easy to display this on guitar due to the tuning of the open strings. We will first show this in treble clef notation and later on give a few examples on the guitar. Both chords have one note in common, the C. If we move from the C triad to F triad, the C note remains constant. If we were then to pick the next note of the C chord, which is E, we must look for a way to move to the F chord in the ‘closest’ way. The note E will move up a half tone to the F. The remaining note of C is G. When moving to F, the G will go up a whole tone to A. This is the most economic way for the voices to move from one chord to another. 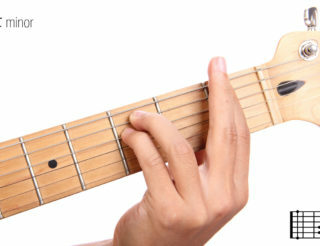 We can do the same thing on guitar in E, going E – A – E.
The top E stays, the B moves up from the open string to the 2nd fret, the G# moves up one fret on the G string. For the bass notes we can use the open E and A string. We recommend using picking here. Now we look at the progression C, G, C.
G is the Dominant, or 5th degree. This chord change creates even more tension, because the tonic root C disappears in G. Still there is a common note (G) which makes the change stable. To show this on guitar we use the same chords and fingerings as before. We now consider A as our key. You can combine the Tonic, Subdominant and Dominant chords (degrees I, IV and V; 1st, 4th and 5th degree) in any order you like. They will always make harmonic sense and have been staples of western musical vocabulary for many centuries. With the dominant chord G7, things work a little differently. It isn’t as easily replaced by its parallel chords. 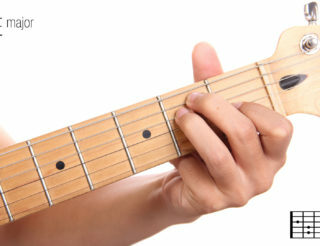 Let us have another look at the G chord, the 5th degree in the key of C. We can make it a 7th chord by adding another chord tone to the G triad (G, B and D). We have to use the next third up from D in the key of C major, which is F. The resulting chord symbol is G7. The dominant chord creates even more tension and goes back to C in a very pleasant way with two voices moving chromatically in countermovement. This resolves into the two most important notes of C major, which are the C itself and the major third – E.
Another advantage of this 7th chord is that we now have a common note with the subdominant chord F; the note F itself. So shifting from F to G7 is not simply moving up with all voices, and is given a little more stability by this common tone. Also, the G7 carries strong tension in itself because the interval between B and F is a tritone. Tritones are some of the hardest sounding intervals (not familiar with this? Then check our post on Intervals). This progression is one of the few well depicted on guitar, using A and E7. Again the top E stays, the C# moves up to D (one fret) on the B string while the A moves down one fret to G# on the G string. 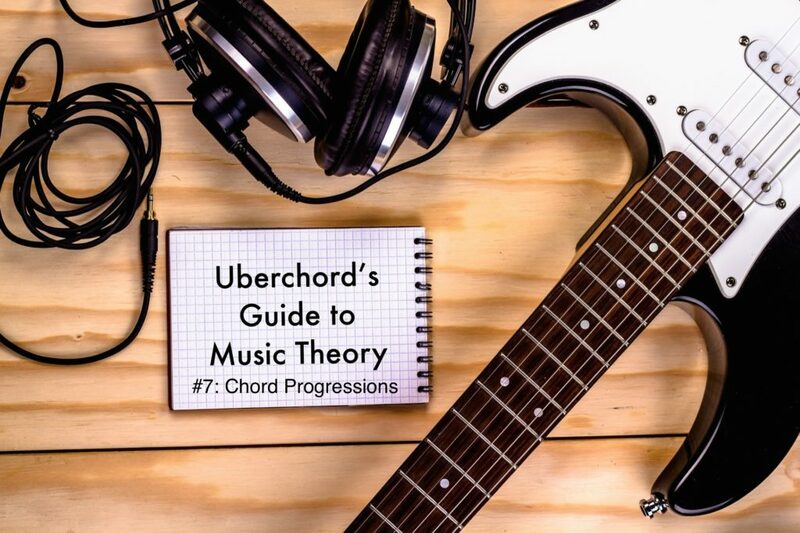 This works just as well in C.
Here you find a few exercises from the UBERCHORD app that use the chords we have discussed. Note that not all of them are in the key of C.
We will look at the main functions in minor keys for our upcoming posts. Please stay tuned to find out about some other very interesting ways of creating beautiful chord progressions by expanding your harmonic vocabulary and replacing certain chords! Ich finde alle Bilder sehr sehr gelungen! Viel Ruhe und WÃ¤rme geht von diesen Bildern aus und macht Lust auf so eine Strandhochzeit – ich wÃ¼rde direkt auch gerne eine foteorafioren.Kgmpliment!